This has been a particularly blog-unfriendly year, between not having a lot of time and not having a lot of interest in canning or baking. I know, that seems weird. It's not like I'm not baking, it's just that it's fairly routine stuff, like cookies or cornbread or the regular batches of white bread I make with Legion whenever we run out. That's still happening, but it doesn't seem all that blog-worthy anymore. I haven't even started a gift stash this year. But it is Thanksgiving, and it's time to stop and rest briefly and have a feast. To reflect on the things that have made this year good and overlook the bad. This year there will be nine of us, and I just brined the turkey. We are having our feast on Friday as I'm working tomorrow, giving me an extra day to bake and prepare. Yesterday I made the squash by roasting my last three farm share butternuts and mixing the baked squash with butter, salt, and pepper. Nothing too fancy. Mom will bring the sweet potatoes we love, our friends are bringing rolls and Brussels sprouts, and maybe a dessert. For the turkey, I mixed 1 cup of Kosher salt for each gallon of water, and put the turkey in that with some bay leaves, peppercorns, sage, celery salt and rosemary. 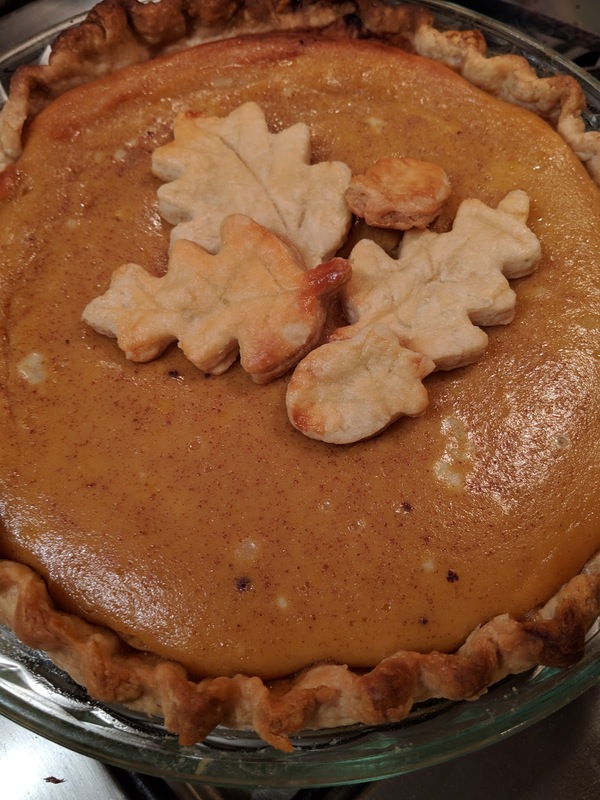 The next thing I did was make two pumpkin pies, using my favorite recipe. Fortunately, I had condensed milk in the house and didn't need to run out and get some. I also had 3 cups of pumpkin purée in the freezer; that may be the last of it. The crust got a little toasty because they were a little too close to the edges of the oven but nothing too bad. I baked the leaves and acorns separately for about 20 minutes so they wouldn't burn. One will go to work with me tomorrow and the other is for my feast. Tomorrow after work I will make an apple pie and also the stuffing, then on the day of I can roast the turkey, make the mashed potatoes, and put on all the finishing touches! It's been sort of cold, sort of warm, very rainy and not exactly great weather to get into the hive. I'd been meaning to make fondant for them, and get the hives insulated. General wisdom is to insulate the hives around Thanksgiving. Which is next week. But it's going to drop to the 30's tonight. So I rushed home and made fondant. One quarter of the recipe posted here makes enough to fill two combiner boards which is what I use to make candy boards for a top bar hive. It cooled quickly and I ran out with all the insulation panels to get the hives tucked in for the winter. Beeyonce's hive was fine, I got the fondant in there and the insulation panels on without an issue. Oh, did I mention I was not wearing my gear or using smoke? This was the irresponsible part, as it turned out, as Phoebee's hive was not as docile. They were, in fact, rather agitated that I was opening their hive on a damp, overcast day. I got the fondant in and three of the four panels on before one decided my wrist was just too close and stung me. Even after spraying it with alcohol the bees were still mad and another got onto my shirt and stung me through it. I decided to leave them to calm down and come back out just before the sun set to get the last panel on. Once inside the house, I discovered that a bee had hitched a ride on my hair and was now in the kitchen. I managed to catch her with a drinking glass and a towel and took her back outside so she could go home. I'm glad she was the only one! I just managed to get that last panel on. As expected, when I went back out there were no longer bees crowding the entrance and I was able to tuck them in nicely. Fingers crossed until the spring!